AdeptiCon 2015 Development: Horus Heresy - AdeptiCon Bound! Horus Heresy - AdeptiCon Bound! As long as I have been interested in Warhammer 40K, the Horus Heresy has held my fascination. It always seemed bitterly ironic to me, that despite the myriad of alien threats bearing down on the human species, the greatness of the Imperium it ultimately shattered from within by our own baser instincts. Or, as my seven year old stated with child-like innocence, “Why would Horus attack his dad?!”. So naturally, my gaming has always evolved or turned towards recreating the events of the Horus Heresy. I’m sure many of you will wryly grin when I ask how often you have searched the internet for how to create Heresy-era terminator pads out of plasticard, read a Black Library novel searching for something interesting to add to your army, scoured eBay for unique sculpts, or anything else that might help to Heresyize your force. When Forge World announced they were doing the Horus Heresy series, being the addict of their resin crack as I am, I knew I should immediately start making deposits in the marriage favor bank for the inevitable withdraws in my future! As if that wasn't enough to cement my descent into Heresy madness, I was asked to help run the very first AdeptiCon Horus Heresy Tournament! I couldn't say yes fast enough! The chance to help run a Horus Heresy event brimming with the exceptional armies and players that Adepticon attracts every year? Sign me up! After the excitement had diminished a little, and I started talking to the AdeptiCon staff about event particulars, I really started to get an idea of just how much work goes into AdeptiCon each year. As a multiple year attendee, I always appreciated how smoothly AdeptiCon ran and the open door policy the organizers had in regards to questions, comments and post-event critiques. That said, it wasn't really apparent just what that work consisted of until I started participating as a volunteer. The organizers really put a ton of time into AdeptiCon, making it the best event of the year. Being involved now only makes me appreciate the previous events that much more. Thanks guys! All that said and introductions done, I would like to address a few of the more popular questions about the upcoming Horus Heresy tournament. Do I have to use Forge World Marks of armour and/or only Heresy-era marines? Why only 1500 points? The short answer is no, Forge World Marks of armor are not required. One of the questions I wrestled with a bit concerning the Horus Heresy tournament this year was what to allow. Obviously, as this is the Heresy-era tournament, it would only make sense that players expect to face aesthetically suitable Heresy-era models. On the other hand, collecting Forge World is certainly not a poor man’s hobby and given the brevity between Forge World release dates and AdeptiCon this year, it might be difficult for the average gamer to get the funds and time together in order to get an army ready. Couple this with the relative cheap cost per marine found within the Legion units and it might turn into a real problem for players. The above affected the tournament in a couple of ways. First, the points total of 1500 will be a bit more manageable for players who wish to collect and paint Heresy-era force. Second, the decision was reached to not exclude those players that did not have Heresy-era models, but rather reward those players that did bring them. Thus, Heresy-era equipment, conversions and modeling will be a boon when it comes to Appearance scoring - but not a requirement to play. I'm very much looking forward to the event and thank you for posting the draft rules! You know...Adepticon is about forty minutes from my house and I've never been. This just might get me to go. Is there a limit to what Legions you can bring? In answer to your questions--no there is no limit to what legions you can bring to the event. 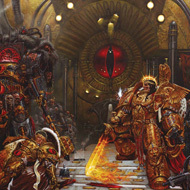 While BL/FW might focus on specific and major legions present at certain Heresy events---who is to say there wasn't a small Ultramarine/Space Wolf/InsertALegionHere contingent present with one of the traitor/loyalist legions? That's what's terrific about 40k--the fluff, while structured--gives rare hard stops and lets players use their imagination. So feel free to bring any legion you would like to play! Although, I can tell you--for my event the Rule of Cool always applies. I love the look of True Scale armies--and appreciate the time/work needed to scale one out. So shoot over a photo to the link above--but I'm sure it will be perfectly fine!